This last Saturday was the club hike to Mill Creek. A few of us decided to also hike Lightner Peak with some added variations. 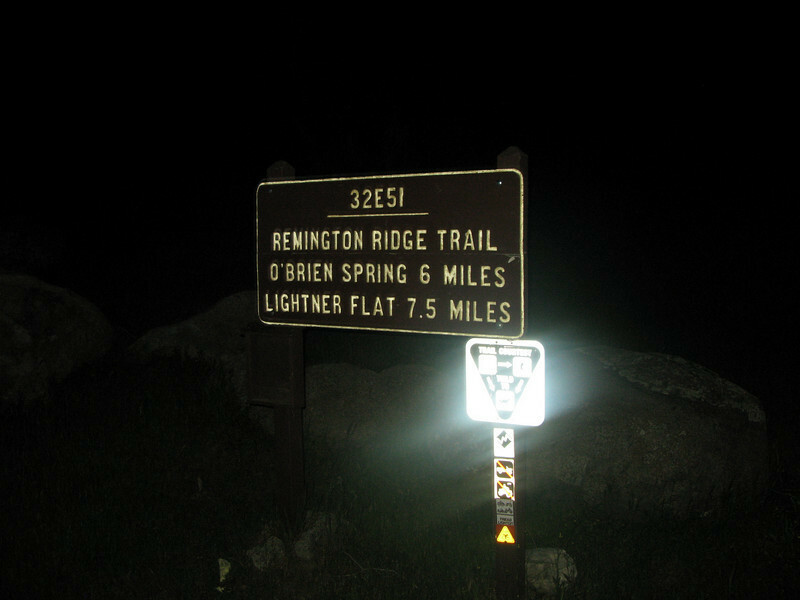 At 5:30am Lisa, Nathan, Karen and I started out on the Remington Trail to hike to Lightner Peak. From Lightner we followed the Hobo Ridge including Hobo Peak benchmark. From here we cross country routed to Lightner Flat. From Lightner Flat we hiked to Breckenridge Campground and then some more cross country to the Breckenridge Lookout and highpoint(7500ft) . We had originally planned to meet Alice, Jill and Nick at Squirrel Meadow and hike down the Mill Creek trail together. They had started two hours after us but were not hiking the Breckeridge part of the hike. A couple of delays on our part and a faulty radio kept us from meeting up at the planned rendevous. Alice's group waited until about 2:30 and then hiked on down the trail. To further complicate the day, we missed the Mill Creek junction at Squirrel Meadow. My GPS was able to confirm the error but we were on a road that seemed to head downhill. After a mile the road turned and was obviously heading back to Breckeridge Rd. My home maps showed a leg of the Mill Creek Trail that led to Lightner Flat( I had also preloaded this track line into my GPS) so we decided to hump over and take this secondary option down. As everyone in the group can tell you - that trail aint no more. We followed an old log road down a ways and then it disappeared leaving only various game trails crossing on either side of the creek drainage. We spend the next 3 hours in some of the worst bushwhacking and sidehilling that I have had to come down in a long time. We barely made it back to the Mill Creek Junction before needing headlights to return to the car. We finally made it back to the car at 8:30pm - making for a 15.5 hour day.Stats on the day included 25.75miles; 7700ft of elevation gain including 4 miles of very rugged bushwhacking.